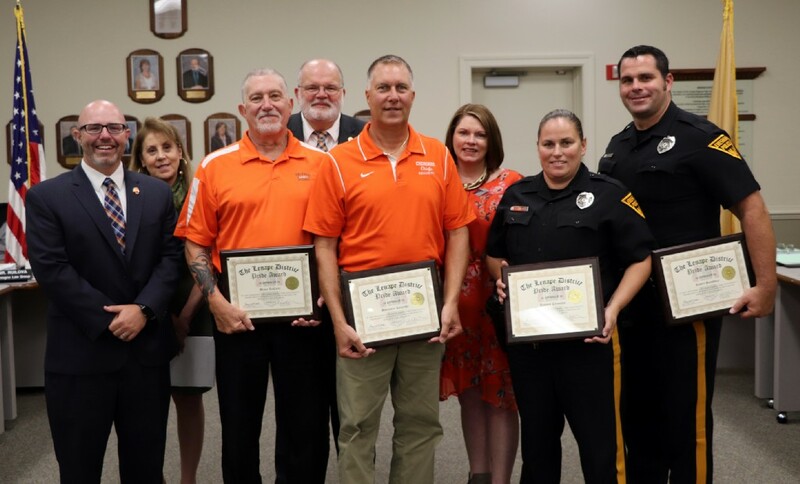 District teacher of the year, two school resource officers and two security staff members were honored. Photo by John Donaldson, LRHSD Director of Media and Communications. David Belville, Donna Charlesworth, Bruce LaCarte, Barry Fitzgerald, Ben Kozarski, Bonnie Olt, Jammie Clements and Bob Hansbury are pictured at the LRHSD meeting on Sept. 12. This week’s Lenape Regional High School District meeting shined a spotlight on staff who stand as inspirations to others. The meeting began with a presentation honoring the district Teacher of the Year, Seneca High School science teacher Dusty Carroll. Her supervisors, principal Jeff Spector and assistant principal Dave Maier, spoke about her qualifications. Maier referred to Carroll as a student-centered, passionate person and stated she is a life-long learner who presents great leadership skills. At Seneca, she takes the initiative to meet with colleagues in her department to build and refine lessons promoting science practices to help students learn the core ideas of science, officials said. Aside from her involvement at the high school, she also keeps in contact with AP chemistry teachers across the region to meet regularly to share ideas. She serves on the state committee to oversee the formation of the updated New Jersey science assessment. Carroll is the vice president of the New Jersey Science Teachers Association, where she creates professional development opportunities for teachers. In addition, she developed and runs a summer program at the University of Pennsylvania where students from across the country join to participate in lab activities and gain valuable experience. Superintendent Carol Birnbohm introduced a video that Lenape District Television and Carroll worked together to create, that was shown to all staff across the district on opening day. Throughout the video, Carroll shared the things that keep her motivated and the people who keep her inspired. “Congratulations, Dusty, and really thank you for being an inspiration for our staff on opening day, it really was a great way to start the school year — having them watch that video and really reminding us why we teach and how important it is to stay on top of our profession,” Birnbohm said. Following that presentation, Cherokee High School principal Donna Charlesworth recognized two school resource officers and two security staff members, who worked together to use security technology and the established protocol to identify an individual who tried to enter the high school. Jammie Clements, Bob Hansbury, Bruce LaCarte and Ben Kozarski were recognized for their efforts. A press release on the issue stated that after a conversation over the intercom, Kozarski did not allow the individual to enter the building, but instead he met the individual outside of the school security vestibule. LaCarte recognized the individual through the security cameras as someone who has been removed from the property previously for trespassing. Charlesworth thanked the resource officers and security members involved, stating she is grateful for their expertise and their relationships with the students. She followed by thanking the families in attendance at the meeting. The next LRHSD board meeting will be held on Oct. 17 at 7:30 p.m. at the Lenape District Administration Building.